Our fourth child was born with cerebral palsy and is now 27 years old. 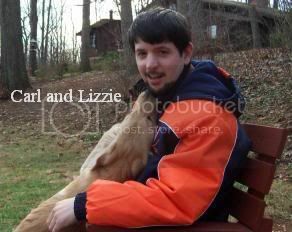 He recently became a resident of the Wiseman house here in Charlottesville which is owned and operated by the ARC of the Piedmont. We make an effort to visit him at least once a week—I like to leave work in the early afternoon and take him home to play with Lizzie in the backyard. I don’t have any scientific proof, but I’ve always felt that all of our dogs, past and present, had a particular relationship with Carl. It’s almost as if they could sense his innocence—they seemed calmer in his presence and formed a unique bond with him. I know Lizzie is good therapy for me and I can see that same effect in Carl. He laughs and enjoys hugging her, throwing her sticks and watching her play. Sometimes, just being in the presence of a good loving dog is all that we need to make this hectic world an OK place. When I worked at The Virginian, a retirement community in Fairfax, there was a regularly scheduled visit from a group of therapy dogs. That day was always the most cheerful for our residents. At Cedars-Sinai, a hospital in California, there is a similar program called POOCH. The creator, licensed social worker Barbara Cowen, notes that after the therapy dog visits, the patients have slower heart rates and require less pain medication. The July issue of “Journal of Gerontology: Medical Sciences” describes a recent test using the UCLA Loneliness Scale. After half an hour a week with a therapy dog for six weeks, 45 patients reported that they were significantly less lonely compared to a control group. I’m sure that research will continue to prove the benefits of therapy dogs. Roberta Taylor, LPN compares the use of therapy dogs to the use of medication including recommended dosage and potential side effects! Click here to read what she has to say. This entry was posted on Tuesday, August 7th, 2007 at 3:38 pm	and is filed under Dog Behavior and Psychology. You can follow any responses to this entry through the RSS 2.0 feed. You can leave a response, or trackback from your own site.